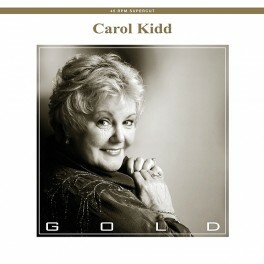 Originally released in 1996 as a genuine 24 Kt Gold CD, Carol Kidd's Gold remains the legendary singer's most sought after album. 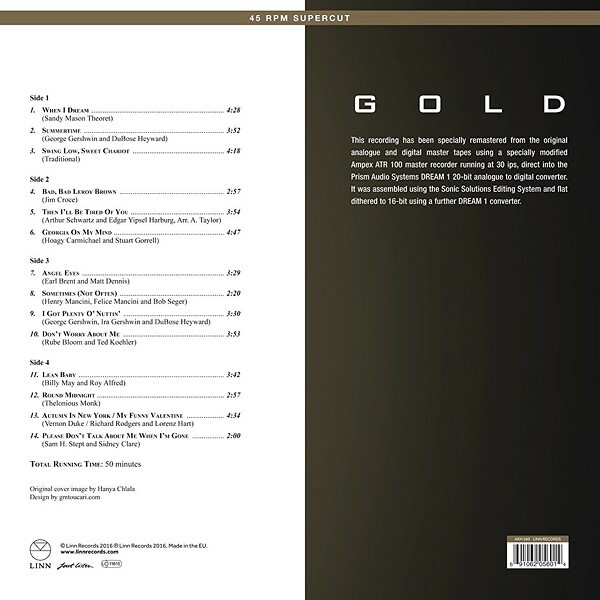 To celebrate its twentieth anniversary Linn has reissued Gold as a 45rpm Supercut 180 Gram vinyl 2LP. Enjoy everything you already love about LPs but more: better dynamics, less noise and a cleaner Hi-Fi response. Encompassing songs from across her early career, Gold includes tracks from All My Tomorrows, Crazy For Gershwin, I'm Glad We Met and her career-launching eponymous debut album. Described as 'one of the best jazz singers in the world' by The Times, Carol Kidd has a flawless sense of timing and her impeccable phrasing is arguably her greatest gift. Renowned for her unforgettable ability to breathe fresh life into any jazz standard, Carol Kidd is a life-long romantic and ballads like 'My Funny Valentine' and 'Angel Eyes' remain favourites. No Carol Kidd anthology would be complete without her signature song, 'When I Dream', made famous by the Korean movie Shiri; it remained in the Asian Music Box charts for a spectacular 13 weeks.